Diabetic retinopathy is damage to the retina caused by complications of diabetes mellitus, which can eventually lead to blindness. It affects up to 80 percent of all patients who have had diabetes for 10 years or more. Research indicates that at least 90% of these new cases could be reduced if there was proper and vigilant treatment and monitoring of the eyes (Screening). The longer a person has diabetes, the higher his or her chances of developing diabetic retinopathy. Diabetic retinopathy often has no early warning signs. On retinal examination, a doctor may see and dot-blot hemorrhages or white spots known as cotton wool spots. Diabetic retinopathy is the result of microvascular retinal changes. High blood glucose leads to incompetence of the vascular walls making the retinal blood vessels more permeable. Small blood vessels such as those in the eye or kidney, are especially vulnerable. Some people develop a condition called macular oedema, where the damaged blood vessels leak fluid and lipid onto the macula, the central part of the retina that lets us see detail. The fluid makes the macula swell, which blurs vision. As the disease progresses, diabetic retinopathy may enter an advanced, or proliferative (PDR), stage when blood vessels proliferate (i.e. grow). The lack of oxygen in the retina causes fragile, new, blood vessels to grow along the retina and in the clear, gel-like vitreous humour that fills the inside of the eye. Without timely treatment, these new blood vessels can bleed, cloud vision, and destroy the retina. Fibrovascular proliferation can also cause tractional retinal detachment The new blood vessels can also grow into the angle of the anterior chamber of the eye and causeneovas. 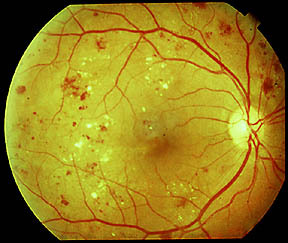 Nonproliferative diabetic retinopathy shows up as cotton wool spots, or microvascular abnormalities or as superficial retinal hemorrhages. Even so, the advanced proliferative diabetic retinopathy (PDR) can remain asymptomatic for a very long time, and so should be monitored closely with regular checkups.